Tom Martin's Q & A appears every two weeks in the Herald-Leader's Business Monday section. This is an edited version of the interview. "Lexington man operates custom-made trumpet business" says Tom Martin, Experienced media professional. 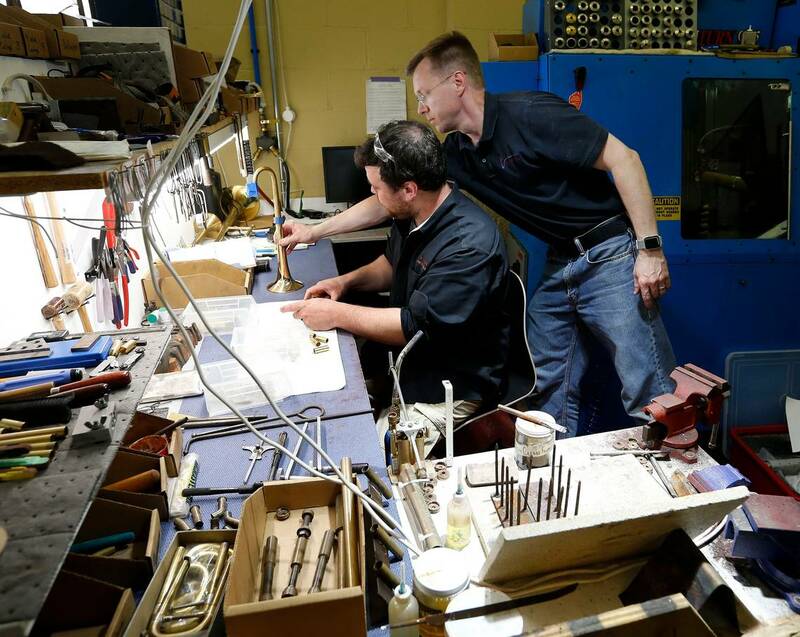 Peter Pickett, right, handed a trumpet bell to Robert Lawson as he assembled a trumpet at Pickett Brass and Blackburn Trumpets, 308 North Ashland Avenue in Lexington. Peter Pickett is a musician who used to be an engineer. It’s rare to find a musician who not only plays his instrument, he also makes them. 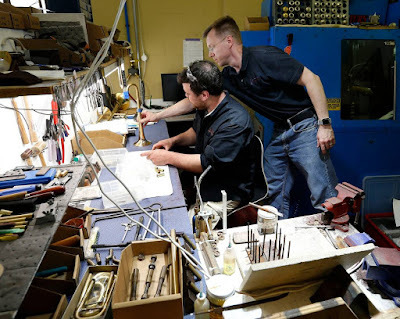 Peter Pickett and his team blend musical and engineering talents in a small shop in Lexington, producing hand-built Pickett-Blackburn trumpets as well as mouthpieces for brass instruments. Tom Martin visited the shop. Question: Let's begin with how, in college, you came around to blending engineering and music. Answer: I went to Virginia Tech in 1991, finishing a bachelor of science in mechanical engineering as well as a bachelor of arts in trumpet performance. My master’s was in acoustics and had a lot of the acoustics of trumpets built into it. So, it really did come to a head by combining those in my master’s. Q: You left college with this combination in your head. Did you go right into that blended field or something else? A: No, because that's a little bit of a pipe dream. When I was looking for graduate schools, I was looking to do auditorium acoustics and concert hall acoustics. That seemed like a grand exciting thing to do. But, I was politely told along the way that there are a select few people who do that and then that's that. So, even though I wanted the acoustics job, I ended up moving to Lexington to work for Lexmark, initially hoping to get the acoustics position, not musical acoustics of course, but acoustics of printers, and computers, and such. That didn't work out either. But as part of my acoustics work, it was a lot of mechanical modeling and making up mathematical models to predict mechanical systems. And that easily applied to acoustics as well as printers. And so, I started working for Lexmark doing that.